And you know what Friday means, right? 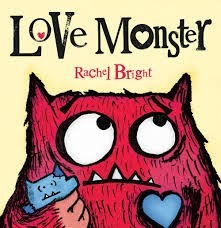 Brief Synopsis: Monster has a hard time being a bit funny-looking in a world of cuteness, so he goes out looking for someone who will love him just the way he is. Why I Like This Book: This book is so cute! Monster is rather funny-looking in his own “slightly hairy”, “googly-eyed” way, but underneath the hair he is sweet and sensitive and only wants to be loved for who he is. That is something we can all relate to 🙂 He searches high… and low… and middle-ish :)… looking for someone who will love him. Things get pretty dark. Literally 🙂 And just when he’s given up… well, I’m not going to TELL you – that would ruin the ending 🙂 The pictures are endearing, and there is a lot of humor to be found in the details. For writers, this is an example of a story that is beautifully done in about 235 words. Little kids will love the delightful pictures and spare text, and slightly older ones will appreciate the humor. Now, I hope you all enjoy reading each other books! I have a date with Princess Blue Kitty (my car, for those of you who haven’t met her :)) PPBF bloggers, please leave your post-specific links on the list below so we can all come visit! Have a great (long) weekend, everyone! Would You Read It #117 – Tell Me About The Baby (MG Novel In Verse) PLUS Straight From The Editor! That IS funny – I hadn't noticed! 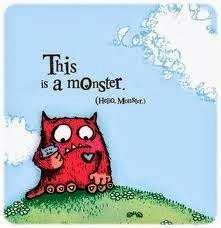 And yes, some days I feel like this monster too! OMG. The radio thing was pretty much horrible. I think I will have to direct laser beams at all recordings and have them destroyed. I felt totally incoherent! And, surprisingly, it appears to be visiting only! There is no laundry!